Does anyone really need a whole book about hot dogs? Well, maybe not. 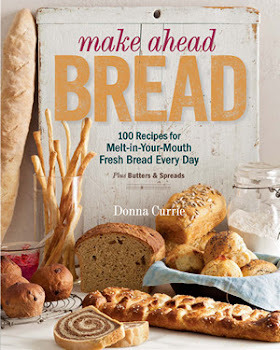 But then again, no one needs a shelf full of baking books, and I have that, too. 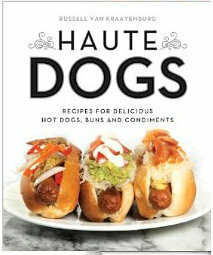 So, now I have Haute Dogs by Russell van Kraayenburg. This isn't just a book about different toppings - although that's part of it - but it's also about different ways to cook hot dogs, different types of dogs and buns, and different regional and national styles of hot dogs. The recipes aren't all about how to assemble the hot dog, either. There are recipes for making buns, condiments, and even hot dogs. I picked El Completo from chile, partially because I had the ingredients on hand. And partially because they sounded so ... odd. Avocado and sauerkraut? Have you ever even thought about that combination? But even though it sounded weird, it tasted really good. I'm looking forward to making some condiments next, and I have a few other dogs bookmarked, for later. I'll admit that no one really needs this book, but it's a fun, and it might inspire you to change up your hot dog routine. I could see having a hot dog tasting evening. trying different types of hot dogs with different toppings. You know what to do. Put the dog on the bun, pile on the toppings, and serve. I ended up adding a bit more of the avocado and sauerkraut after the first assembly, but of course, you can add the toppings to suit your own taste. Okay, I'll admit it. The bun in that photo isn't toasted, as the recipe says. I was in a bit of a hurry to assemble the beast before I lost the light for photos. And ... *sigh* ... I was hungry. Go ahead and toast your buns. I think it's a good idea for this particular dog. I received this book from the publisher. I was not required to write about it.